For longer than I can remember I have stuck to good old Simple Moisturiser. It’s very good, does the job, and most importantly (to me anyway), doesn’t react with my skin. But sometimes a change is as good as a rest. Recently, while having a bit of a browse in Savers (so much cheaper for skin care than either boots or superdrug, just maybe lacks on the range a bit), I spotted this and thought I would give it a try. Usually my makeup does tend to rub off quite fast in the day and due to my rubbish rubbish skin sometimes when applying makeup it doesn’t go on quite as good as I would like it to. 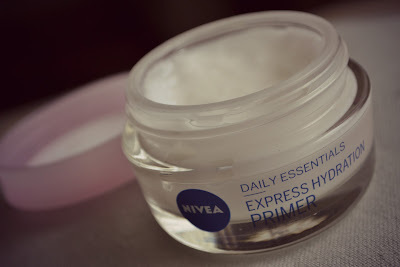 I’m not one for sticking loads of makeup on my face, so I wouldn’t want to put a moisturiser on then a primer, then... yada yada yada, so it’s good that this acts as both and does give a bit of a bse for your makeup. 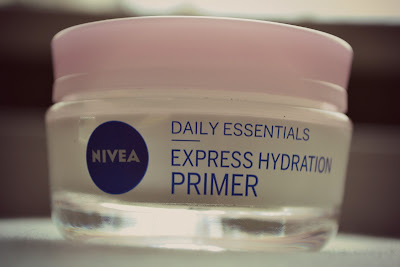 It’s not as good as a normal primer, not that I’m an expert (or own any for that matter, I have just been informed by my sister), but I do think it does do a better job than just my good old Simple Moisturiser. Thus far I have not had any kind of reaction to it (thumbs up for that one), and what spots and blemishes I do have, it has given me a better base to apply my concealer and powder. Overall, I would say that this is a good product and does what it says on the tin. If however your a hardened makeup fan who really loves all the different products, you will need a separate primer, but it does act as a good moisturiser. Additionally, at only £3.99 (roughly, from superdrug), I think it’s really good value! Thumbs up for Nivea here! Thanks for the review! Have seen this but never got it! I will try, I think my skin is starting to hate me. Am always I perfect skin so no need to take care of it, well ya I do. I love the looks I can get with this.It's a definite Iink isSkinlastin.already know which is my favorite and it surprised me - the <a winner. Of course the whole box is great.